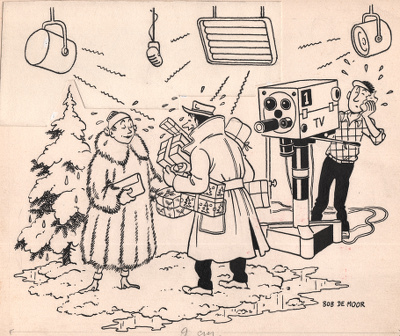 Christmas/New Year’s cartoon which Bob De Moor made for Publiart on December 28th 1953. The drawing we present you here shows very well how Bob De Moor often reworked his original drawing to get it as perfect as possible. If you look closely, you’ll see that the drawing consists of no less than 3 layers, all glued one on top of the other to correct an inking, to correct a composition or to add a different background. We have no idea in which Publiart publication this was published, if someone can give us a clue, please let us know! Brabant Strip published an article in their recent issue referring to this article. And luckily for you they did know where this drawing was used. As it happens the Belgian radio/television broadcast NIR/INR had started with a new section, namely ‘variété’. Nobody else but Bob De Moor – via Publiart – is asked to make a special Christmas/New Year card for the NIR/INR. The card was made both in dutch and french. Brabant Strip will also publicise a correction in their next issue as they had wrongly assumed that Publiart was not involved in the making of this card. The back of the drawing however clearly has a Publiart reference and this despite the fact that the company was officially only created in July 1954… but Guy Dessicy told us a while back that Raymond Leblanc had already launched it way before that. This is the last article for 2014, we wish you a Happy New Year and rest assured, 2015 will bring a lot more treasures from one of the best comic authors Belgium has known. A few days ago you could read an article on the work Armand “Mon” Van Meulenbroeck did for Artec Studios, the company founded by Bob De Moor and John Van Looveren. Today we present you another comic which has always been attributed to Bob De Moor, but which is not by Bob De Moor at all: Tim & Tom. Up until today people claim this is Bob De Moor’s work. The page scan we present you today comes from an issue of the 1949 (another source indicates it was published in 1951) edition of the weekly youth journal ‘t Kapoentje. The comic series is called ‘Tim en Tom’ and the story is called “Tim en Tom erven een Kasteel” (“Tim and Tom inherit a Castle”) and this story has always been said to be by Bob De Moor in many publications (with some writers saying that “one can clearly recognize the Hergé-esque influences…” Really?). Weird, because it doesn’t take much time for anyone familiar with the work of Bob De Moor (or drawing as a matter of fact) to raise a few question marks when seeing this page. The style as used in the drawings has close to nothing in common with what Bob De Moor drew around that time. It also showed some very clumsy drawing (shoes, hands, …) which – although Bob De Moor was working at speed tempo around that time – you would not expect from him. 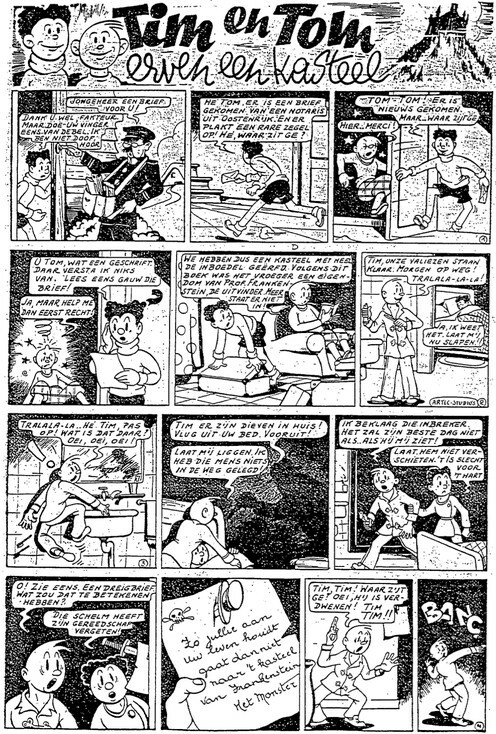 But, the story did come from the Artec studios, you can see the Artec Studios signature on the second strip, and that for instance led to the people from Stripofiel claiming that ‘Tim en Tom’ was by Bob De Moor in their issue nr. 8 from 1974. 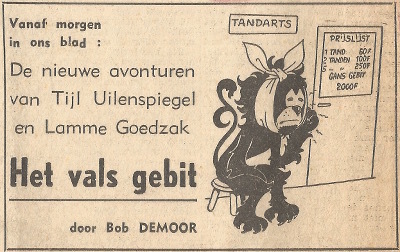 Danny De Laet – who first also attributed the series to Bob De Moor, rectified his judgement in “De Vlaamse Strip Auteurs” (published by De Dageraad in 1982) on page 43 saying that the ‘Tim en Tom’ story was “definitely not by Bob De Moor”. An almost sure thing is that the drawings were made by a flemish comic author, the use of ‘ge’ (flemish for ‘you’) was never used in the Netherlands for instance. 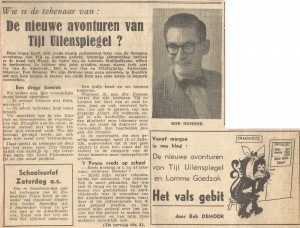 It’s also seems to be a one-off story which was published in both KZV and in t’ Kapoentje, but which seems to have been interrupted only to be continued in Het Wekelijkse Nieuws. So it doesn’t seem like it that the editorial staff of ‘t Kapoentje were all that happy about the result of the work. But who was the artist then behind this ‘Tim en Tom’ then? John Van Looveren possibly was the storyteller (he did love the castle theme a lot), but who made the graphics? 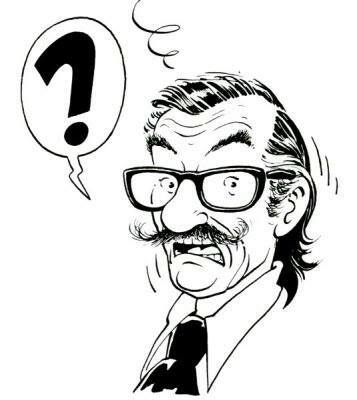 Armand “Mon” Van Meulenbroeck comes to mind (again), after all, he was the only comic artist ever to be paid by Artec Studios next to Bob De Moor. Compare the first case in the unfinished drawing in this article with the second case in the first strip of today’s scan and you will see a few similarities. But as a whole, it’s a mixed bag of influences; you’ll will recognize a Willy Vandersteen touch (see the postman) next to a not so well executed Hergé imitation. If you ask us, Bob De Moor didn’t provide rough sketches for this series like he did for the cartoon series we talked about. The series is far from being a graphic chef d’oeuvre, but as a historical document it serves its purpose rather well. After all, the few years that the Artec Studios were active, represented a very important milestone in the history of the flemish comic scene, whether it was Bob De Moor or not making the drawings. 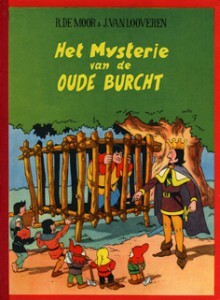 The Artec Studios were founded in order to sell Bob De Moor‘s comics with or without scenarios by John Van Looveren and this to a rather huge number of publications. However, some of these drawings were not (completely) by Bob De Moor. Due to the enormous work that Van Looveren contracted, several people started helping out. Today we present you such drawing which was completed by Armand “Mon” Van Meulenbroeck but which has been on the market as being a Bob De Moor drawing, just like several others. The inked cartoon, signed AVM. Mon Van Meulenbroeck was an early friend of Bob De Moor and he was just like his friend Bob De Moor forced to work at the German Erla factory (see also our article on this 1944 painting by Bob De Moor where we talk about the Erla factory). That friendship led to Mon Van Meulenbroeck being asked to join the Artec Studios team to help with Bob De Moor‘s growing output. The cartoon we present you today was signed by AVM which stands for Armand Van Meulenbroeck and dates from 1947/1948. It’s unclear whether Bob De Moor delivered him penciled indications, but there are indications to believe he did (De Moor literally said in an interview in the 70s that he did offer quickly penciled sketches and indications after which ‘a friend’ completed the final drawings). This procedure was also suggested in Ronald Grossey‘s biography of Bob De Moor. Sure thing is that Van Meulenbroeck tried to make his work in the spirit of De Moor’s including the same inking style which is similar to that of Bob De Moor. The gag is called “Hoger en Hoger!” (Higher and Higher). The uncompleted almost completely erased penciled cartoon on the back. But the ‘clumsy’ way Van Meulenbroeck drew the feet/shoes is a good indication that this is clearly not Bob De Moor at work. If you compare similar work (the shoes for instance, the postures, …) by Bob De Moor around that time you will clearly spot the difference (read the Brabantia Nostra books to spot it). The cartoon itself here shows a kid walking on stilts and apparently standing so high that he gets picked up by a low flying plane. Surprisingly enough, the back of the drawing revealed an almost completely erased cartoon. This incomplete cartoon included a joke about a tram which the leading figure is taking. 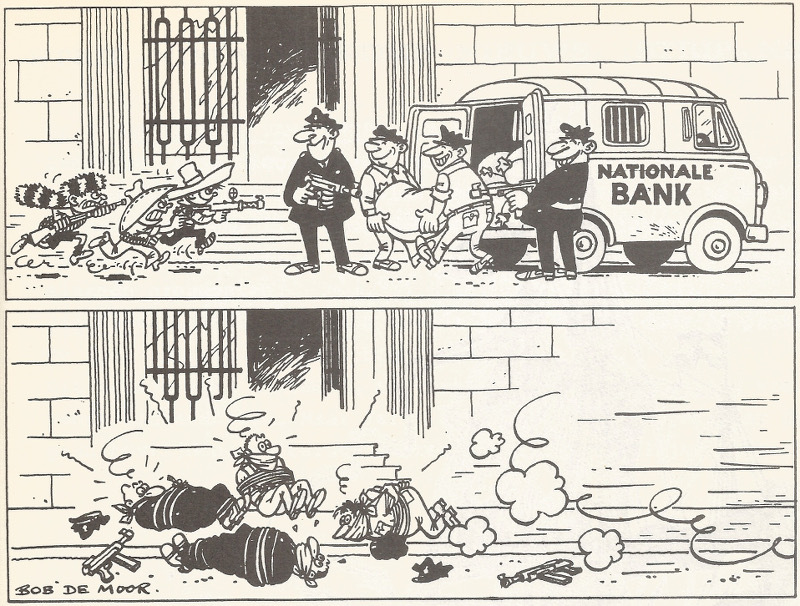 Again you can notice the typical ‘wrong’ shoes by Van Meulenbroeck in the first frame. Tomorrow we’ll show you another drawing which has been considered a Bob De Moor one by many, although it’s clear from the first frame that this is not Bob De Moor at work, at all. The Artec Studios years have not been well documented over the years, making it very difficult to know who did what. In a document which Danny De Laet wrote in 1979 it’s said that Artec Studios also employed the Woodpeckers brothers Jef and François “Cois” Cassiers but the bookkeeping from Artec Studios only revealed payments to Mon Van Meulenbroeck. which means that either the brothers Cassiers did everything for free or that they have never worked for Artec Studios at all. Special thanks to Olivier Marin (“Les déesses de la route”, “Le mystère de la traction 22”, …) for letting us dig in his archives and Ronald Grossey for his feedback. Out now is the 100th album in the Fenix Collection by Brabant Strip, namely Bob De Moor‘s “Le Mystère du vieux chateau fort” albeit in a Dutch version with the title “Het Mysterie van de Oude Burcht”. The album is released as a hard cover, full color, in Dutch and they have succeeded in keeping the original colors of the book quite intact. We compared both versions and it’s safe to say that they did a brilliant job. Also the special lettering from the original French edition on Campéador (1947) has been included and gives it that specific touch. The cover of the Dutch version to be released by Brabant Strip. The book is limited to 1000 copies and available from your local comicstore in Flanders and Holland. But be fast, this will become a collection item in record time! We had a short chat with Jean Smits, vice-president of Brabant Strip to talk about this first Dutch version of this Bob De Moor classic from 1947. How come that this album got chosen to be the 100th one? Jean Smits: For the 100th album in our Fenix Collection we asked the members of the working group for something special in terms of both content and form, and preferably something of a Flemish “master”. Marc de Lint soon suggested we’d go for a Dutch facsimile edition of “Le mystere du vieux château fort”. Everyone agreed that it was a great idea. For the reissue you have used the original first edition but not the original plates? It’s amazing though how the colors kept the same vividness as in the original first edition. Jean Smits: The original plates entered the market a few years ago and are now scattered among collectors. We have been able to locate a number of plates and even the films of the whole book. But ultimately, we decided to start from a topnotch copy of the original book. Mike van der Veer scanned everything, cleaned it up, emptied the text balloons and lettered them in Dutch. Mike also worked on the design and layout of the book plus the cover. Afterwards the printing company Cultura in Wetteren did a highly professional color correction to get the colors as close as possible to the original colors of the book. We are very grateful for the involvement of Jan De Meester from Cultura in this project. He helped us a lot and was closely involved in all the steps of the production process. The translation did not happen from the original Dutch written script which we found in the archives of Ludo Van Looveren. Why? Jean Smits: We actually were not aware of the existence of this original Dutch written script. Marc de Lint translated everything and Mike van der Veer has proofread it before he added the texts in the text balloons. After that everything was reviewed thoroughly and the text was adapted in the same way as the text balloons in the original book. A PDF was then created and again proofread by several people after which a few corrections were made. I have heard that you plan to release more older Bob De Moor material. What is exactly scheduled? Jean Smits: Indeed, there is still a lot of old De Moor material that awaits a rediscovery but it is still too early to let you know what we plan! 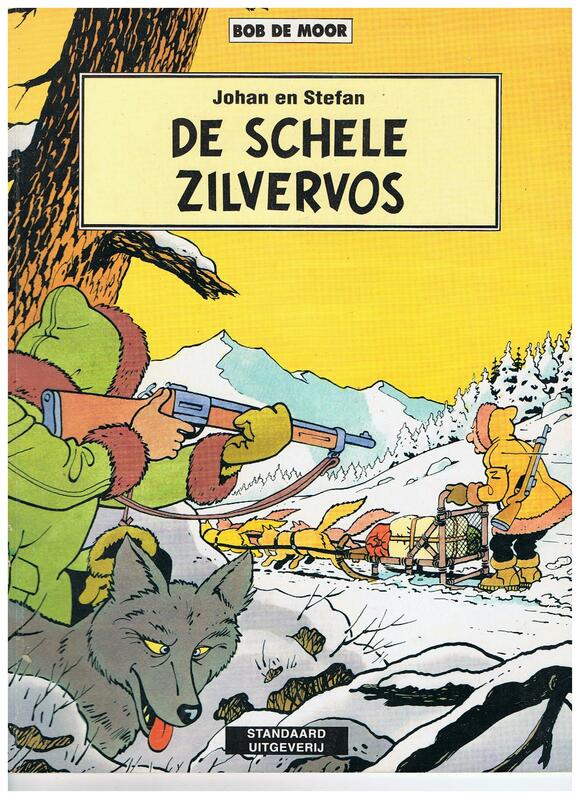 In 1956 the album “De schele zilvervos” (dutch for”The squint-eyed silver fox”) by Bob de Moor was released. This 4th album in the ‘Nonkel Zigomar, Snoe en Snolleke‘ series has a peculiar twist in the original cover artwork if you compare it to later editions as we already reported a few months ago. The new version as drawn by Bob De Moor. In the very first artwork (which you can see on the left) you see a fox next to the gunman. In a later version for the Magnum Series reissue that fox would be replaced by a real squint-eyed fox – the animal also appeared as such in the album. 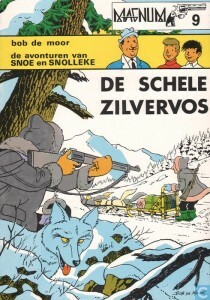 Bob De Moor completely redrew the cover adding more details to the sleigh and to the equipment of both the gunman and Uncle Zigomar. The reason for redrawing the frontcover is clearly the fox who looked a bit out of place in the first version. The cover artwork as drawn by Johan De Moor for the Standaard Uitgeverij reissue. But the later version as released by Standaard Uitgeverij not only saw the dutch tekst rewritten (with less Antwerp-flemish) but also had a new cover. A new one? Many won’t have noticed, but if you look closely you see that the cover has been completely redrawn. You can see this when comparing the inking of the Magnum Series version with the Standaard Uitgeverij version. Nobody else but Johan De Moor inked this new version, holding less ‘fat’ lines, probably because the original drawing had gone lost or at least was untraceable. You will also notice that for this version the ‘Bob De Moor’ signature is no longer added on the cover artwork which was already an indication. It was Olivier Marin who made us aware of this difference (which if you look just quickly isn’t really notable); in the future we’ll also show you a reproduction of the newly inked plate in the future. When Mars and Sabena unite, you get a De Moor wedding! 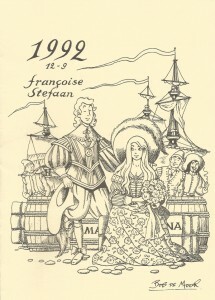 On September 12, 1992 Stefaan De Moor, the youngest of the 5 De Moor/De Belder children, married his girlfriend, Françoise. The wedding took place only 10 days after the funeral of Bob De Moor. Although it might seem a bit odd to have a wedding so soon after burying a father, it was Bob De Moor himself who insisted that the wedding would go ahead as planned. In Ronald Grossey‘s Bob De Moor biography you can read that Bob De Moor pleaded to go ahead with the wedding because “it’s all fun after all” when Françoise visited him in the hospital a few weeks earlier. The wedding invitation card as created by Bob De Moor. Bob De Moor had even completed a drawing for their wedding, and it’s that drawing which we will present you today. It comes out of the collection of the family De Moor and is not that widely spread outside the family circle (although it seems some people took the opportunity to sell their invitation for big money afterwards). The drawing is a classical Cori inspired one with Stefaan and Françoise prominently added in the middle. 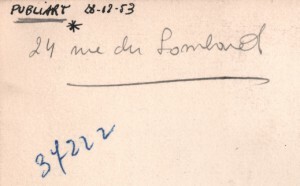 The ‘Ma’ and ‘Na’ inscription comes from the companies the couple worked for at that time. Stefaan worked for the european division of Mars (known as Masterfoods Europe until the end of 2007) headquartered in Brussels, while François worked for Sabena, the national airline of Belgium which filed for bankruptcy in 2001. But when linked together you also get the word mana, the archaically spelled name for manna, which is an edible substance that, according to the Bible and the Quran, God provided for the Israelites during their travels in the desert. It probably was a word game by Bob De Moor to refer to Stefaan’s job (the food sector) or wishing that the couple would have a fruitful marriage. We’ll update this article in the next few hours. 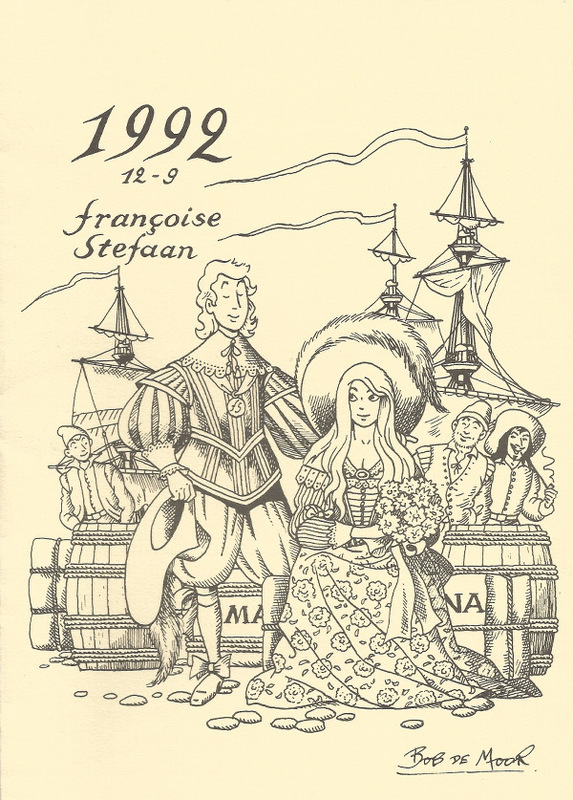 You can also see a medaillon around Stefaan’s neck holding an F (Françoise) and an S (Stefaan). In 1975 issue 3 of the magazine Stripklub Nieuwsblad (one of the many publications by Karel Driesen) dedicated 7 of its 16 pages (yes, it indeed was really a very small magazine) to Bob De Moor. But it must be said that these pages did include quite a lot of material which you will never find elsewhere. The cartoon we show you today was one of 2 printed on page 11 of this magazine. Thanks to Luc Demeulenaere for providing the publication. Today we present you this cartoon originally created in (or before?) 1975 1968 and first published in the Laurel et Hardy magazine from that year (thanks to Olivier Marin for this correction). An atypical cartoon by Bob De Moor. 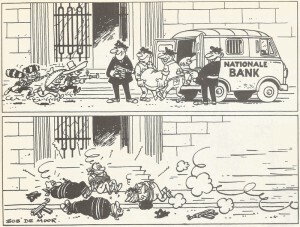 The drawing style of this cartoon clearly reminds of the more nonsense style he used for Balthazar and if it weren’t for some elements, many would not even recognize it as being a Bob De Moor cartoon. However, the typical curled line behind the running kids is a clear indication we have a clear line cartoonist at work with his graphical roots embedded in the Hergé style. The only conclusion you could draw around that time was it had to be a Bob De Moor (and it being signed helps too of course). The cartoon presumably was used during a cartoon exhibitions at the Belgian coast, we guess at the Cartoonfestival Knokke Heist, though we aren’t sure (if you have more information on this cartoon, let us know). Interesting detail, the magazine also features material from Leo Fabri (Marjolijn, Mirmoeff), according to Bob De Moor the best Flemish comic artist around that time. The name Leo Fabri, or at least his work, will ring a bell with many Flemish readers as his drawings and cartoons were omnipresent in the De Standaard / Het Nieuwsblad / De Gentenaar newspapers from 1968 till late in the 80s. His style is quite a refined one and very much influenced by the 60s and 70s ‘flower power’ way of drawing. One of those artists which don’t get enough attention truth to be told. 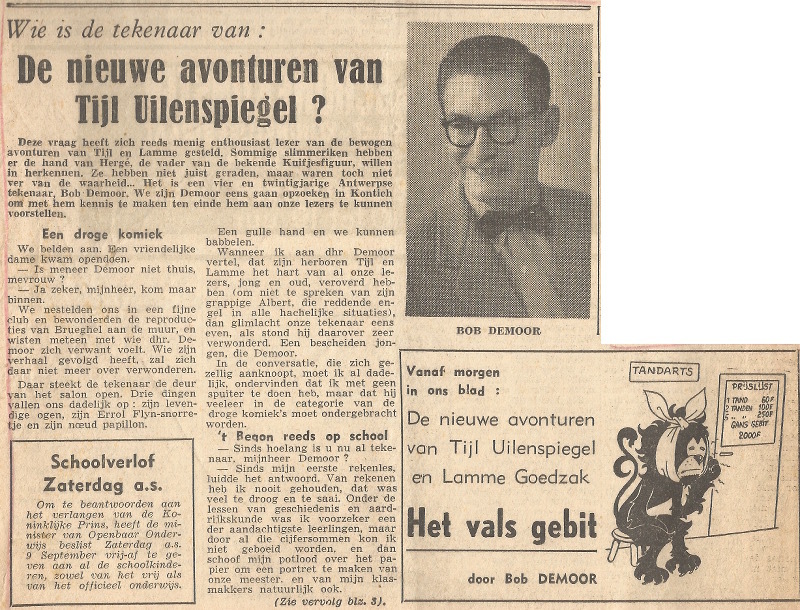 On September 7th 1950 the newspaper Het Nieuws Van De Dag announced a brand new story from Bob De Moor, “Het vals gebit” featuring Tijl Uilenspiegel and Lamme Goedzak, which would start the day after. It was the second album which Bob De Moor drew for that series after he debuted earlier that year with “De nieuwe avonturen van Tijl Uilenspiegel”. We traced back that very journal, thanks to Ludo Van Looveren who had a copy at home, and today we bring you that article and the drawing that accompanied that very article. The illustration that accompanied the Bob De Moor interview. The illustration that accompanied the article has never been published again since 7 September 1950, so it’s with some pride that we can present you this drawing, more than 64 years after it appeared for the first and last time! The article (spread over page 1 and 3) itself talks about who is exactly behind the Tijl Uilenspiegel series. The article says that many readers say they recognize the hand of Hergé in the comic series. “Not far away from the truth” the article says, “as it’s Bob Demoor (sic)”. 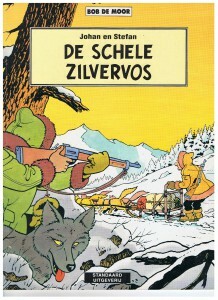 Bob De Moor, 24 years old and living in Kontich near Antwerp at that time, was by then working for both the Journal Tintin and Hergé; and indeed, his style had already been influenced heavily by that of Hergé. The interviewer furthermore continues with questions about his earlier work and his youth in the Parish Library where he devoured pirate stories. Note the wrongly spelled name of Bob De Moor. You can read both newspaper excerpts on the left (will be easy if you read Dutch, a bit more difficult if you don’t). It’s written in the typical old-fashioned style and very ‘stiff’ for today’s readers. De Moor also alludes furthermore what the story “Het vals gebit” (“The false denture”) is all about, referring to a few lines from the popular Flemish song “De Vlaamse Leeuw” (“The Flemish Lion”). Part 2 of the story as published on page 3. Not surprising, in the story the duo Tijl Uilenspiegel and Lamme Goedzak had to save Flanders which was in trouble (hence the Flemish Lion with dental problems in the illustration). But we’ll come back on the actual content of this precise story as it can’t be explained in just a few lines, the historical context being a quite complicated one. It suffices already to say that this album was among the most politically inspired ones he would ever make. The album would only be released for the first time as a softcover in 1984 in the Magnum series by the publisher De Dageraad including cover artwork by Bob De Moor which was created in 1984 or 1983 especially for the occasion. It would never be published in French, the content being probably too Flemish to interest non ‘locals’. The 2nd (and last) edition was actually a special deluxe hardcover re-edition made in 1997 via Bonte Uitgeverij on only 48 copies and this on the occasion of “Damme boekendorp”, a book event in Damme, near Brugge. When ‘Tintin and the Picaros’ was pre-published in Journal Tintin in 1975, the 2 pages before the actual first pages of the pre-publication included a typical Tintinesque ‘dance’ (in Flanders we would call that a type of ‘Polonaise’) featuring kids running in a ‘3’ shape way from the extreme left to the extreme right hopping over and through the letters “Tintin et les Picadors”. 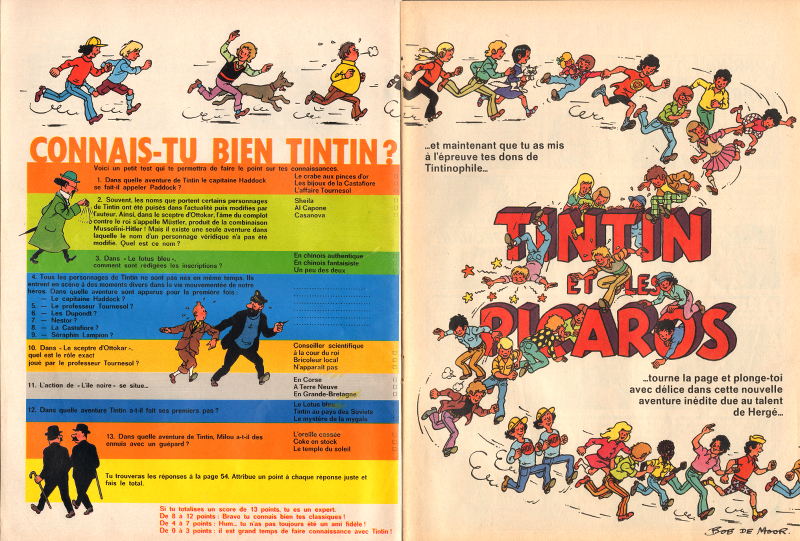 The double page was drawn by Bob De Moor and started with a small quiz on Tintin. Today we present you this page which many have forgotten. “Tintin and the Picaros”, the twenty-third volume of The Adventures of Tintin, saw a pre-publication in the Journal Tintin which began in 1975 and ended in 1976, the same year the first edition of the album was released via Casterman. The double page we present you here showcases perfectly the then popular dressing code for kids including the now almost totally extinct dungaree. You’ll also notice a twin, which is not a reference to the twin brothers Igor and Grichka Bogdanov, they would only gain notoriety with their 1976 book “Clefs pour la science-fiction”. If anyone remembers what those twins could have stood for, let us know!